Adolf Hitler was a German politician and the leader of the National Socialist German Workers Party (German: Nationalsozialistische Deutsche Arbeiterpartei (NSDAP), commonly referred to as the Nazi Party). He was chancellor of Germany from 1933 to 1945 and dictator of Nazi Germany (as Führer und Reichskanzler) from 1934 to 1945. 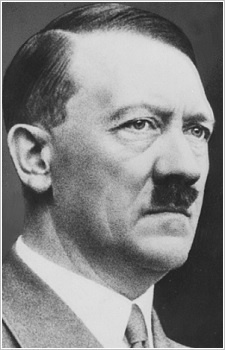 On April 30, 1945, Hitler committed suicide by gunshot, along with his wife Eva Braun who bit into a cyanide capsule. He is commonly associated with the rise of fascism in Europe, World War II, and the Holocaust. pretty sure the nazis wouldnt have liked anime, let alone to know the fall of japan. hitler was a pretty bland antagonist.